“Graphic Quilts at the Gregg” Quilt Exhibition is on at North Carolina State University’s Gregg Museum of Art & Design in Raleigh, North Carolina, now through October 4, 2009.
and two Sas Colby art quilts. 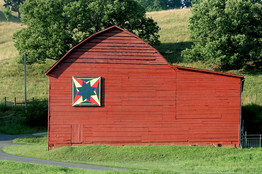 Right now I am thinking about a trip to Athens to Quilt National, and then some time spent driving along the barn route, at least in Athens County; hopefully there’ll be time to see more. What fun! “Pennsylvania Quilts: Studies in Color” A Century of Antique Quilts From the Packwood House Museum’s exhibit is on until October 24, 2009, at the Packwood House Museum in Lewisburg, Pennsylvania. When going to the web site, press Pennsylvania Quilts. An original of a crib-size quilt, reproduced and made by the Piecemakers of the Susquehanna Valley, which will be raffled for the benefit of Packwood House Museum. Photo is the Museum’s. This photo is the McCord Museum’s. You will see the symbol below when you check a quilt photo. This tells you what you can do with the photos. Go see the quilts. They are lovely! You can also learn about this pictured quilt. This quilt garden in downtown Elkhart is the starting point in the 16-garden tour. Does this sound like fun or what! The NQA (National Quilting Association) show is just around the corner, June 18 – 20, 2009, in Columbus, Ohio. The Embroiderers’ Guild of America is exhibiting “Through the Needle’s Eye”, a display of textile art created with needle and thread, which is on until August 9, 2009. Maps can be downloaded at www.quilttrailswnc.org. You can start the quilt trail in Burnsville and pick up a print guide at the Yancey County Chamber of Commerce building’s gift shop. It’s a beauty! Not too late to start, and it’s free!